I want to thank you for giving me the opportunity to review your site. I found it to be in the top 10% in design and aesthetics. I simply loved the navigation bar! Your hard work is certainly on display and your technical skill is evident. You are also sharing a wonderful resource with the Internet community while keeping the aesthetics of your site well intact. Congratulations. You have been awarded the JG Gold Award. What an OUTSTANDING SITE! I love the design. This is great work!! Interesting content too. I will spend some extra time at your site! Love the Networds. Congratulations! After a thorough evaluation of your Site Design, content & originality Ababeel.com would like to announce that your site has been awarded the "Best of Ababeel Awards." Once again congratulations and keep up the good work. 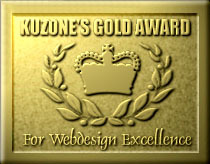 Congratulations, you've won KuZone's Gold Award for web design excellence. You have a very professional-looking site. Keep up the good work. By the way, thanx 4 that joke. Scientists are trying to build the ultimate moron; and using me as the blueprint.